You’re a busy English teacher – between lectures, lesson plans, and grading countless papers, you don’t have much time for yourself. Lately, you’ve felt more self-conscious about your crooked teeth when you stand in front of the class to educate them – you want a straight smile, but don’t want to call attention to your existing issues with a mouthful of metal. And, you don’t really have time to see a dentist every two weeks to get traditional braces adjusted. What can you do? With Invisalign in Toledo from Dental Group West, you can get the perfect smile you deserve with this invisible treatment method that’s fast and effective. Invisalign is the premier choice for clear braces. Using invisible acrylic aligners that are 100% customized to your smile, these gradually move your teeth into place gently and produce great results. To start the process, you’ll discuss how you want your ideal smile to look with your dentist in Toledo. You’ll work with our team to create a 3D model of your current smile. Then, you’ll get a sneak peek at what your smile will look like through the use of digital image technology. We’ll send your impressions to the lab who will custom create your clear aligners. Your Invisalign will be shipped to you altogether and they’ll be numbered for your convenience. Simply wear the trays in order, switch to a new pair about every two weeks, and be amazed by the results. You’ll only need to see us for a few checkups throughout the process, saving you the time of visiting us for traditional orthodontic adjustments. Why Is Invisalign The Clear Choice Over Traditional Braces? Balanced Diet – Since you’ll take Invisalign out whenever you eat, you’ll still enjoy a wide variety of foods – from carrots to apples to corn on the cob, you won’t miss out on the nutrition you need. And, you can even enjoy treats like popcorn and caramels. Comfort – Since the clear aligners apply gentle pressure to move the teeth, they’ll be remarkably comfortable to wear. You can say goodbye to dental wax, too, since Invisalign won’t irritate your cheeks and gums like metal braces would. Invisible Treatment – If you’re self-conscious about your smile to begin with, why would you want to make your crooked teeth more obvious with a metallic grin? 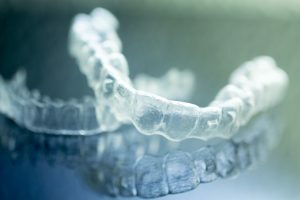 Although these clear aligners are incredibly effective, they’re thin and practically invisible. Even people wearing Invisalign forget they have them in! With this treatment, the only thing people will notice is your perfect teeth. Absolutely – we confidently reassure our patients that this straightening method produces excellent results. But, if you don’t believe a team of experts with over 50 years of combined dental experience, perhaps the popularity of Invisalign among celebrities will convince you. Stars like Khloe Kardashian and Anna Kendrick – who rely on their perfect teeth to keep them in the public eye – have gotten their red-carpet smiles with these clear aligners. So, now that you know why Invisalign is the clear choice over traditional braces, schedule your appointment with Dental Group West today and get the perfect smile you deserve!